Homemade Pizza Dough cannot be replaced with store-bought, after you’ve tasted it. The process isn’t all that difficult, and it makes pizza one of our favorite meals to eat! Pizza is our favorite meal. What’s yours? Mike and I were recently talking about our fav meals (cuz that’s what you do when you’ve been married forever and are 98% empty nesters), and agreed that pizza is top of the list. Like tip top!
. I’ve got a bunch of them, after years of collecting, and I’m using them more than ever for my blog. I started this blog post eons ago, and decided it’s time to share. Maybe past time. I’ve shared it with several people already, and they’ve all been pleased. This recipe consists of only six ingredients – yeast, sugar, water, salt, olive oil, and bread flour. Here are a few tips for making the most EPIC pizza dough. When you add the warm water to the yeast and sugar – be careful to use WARM water, not hot. If the water is too hot, the yeast will disappear and you can’t make pizza dough without yeast. Also, do not use cool water because it won’t activate the yeast. The dough shouldn’t be overly sticky when ready. It should bounce back slightly to the touch. Over time, you will learn exactly how much flour is needed to make the ultimate pizza dough. Unlike french bread and cinnamon rolls, this dough only needs to rise once. When done cooking, the bottom of the crust should be slightly brown and crunchy. This dough can easily be frozen in individual rounds. See more below. Tips for freezing the dough for a rainy day. 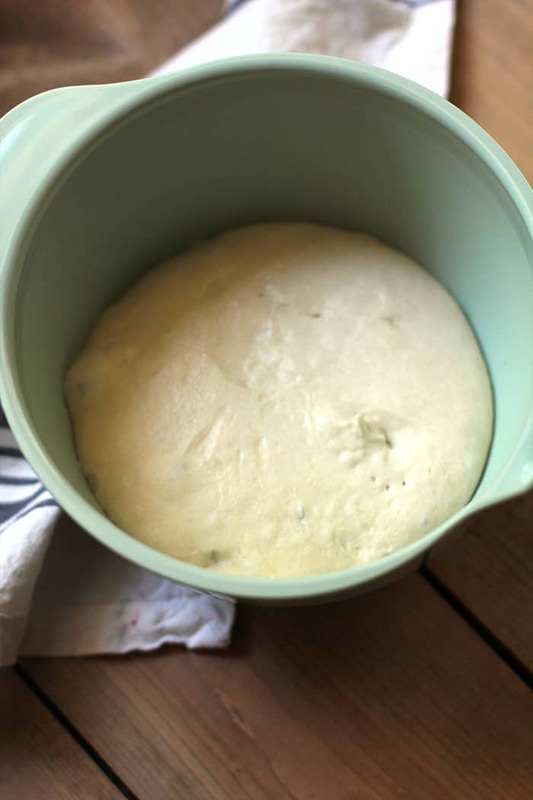 I love making a batch (or two) of this homemade pizza dough, and storing the majority of it in the freezer. Here’s how I do it. Instead of pressing the dough into a skillet or pizza stone, form into balls and wrap in press-n-seal. 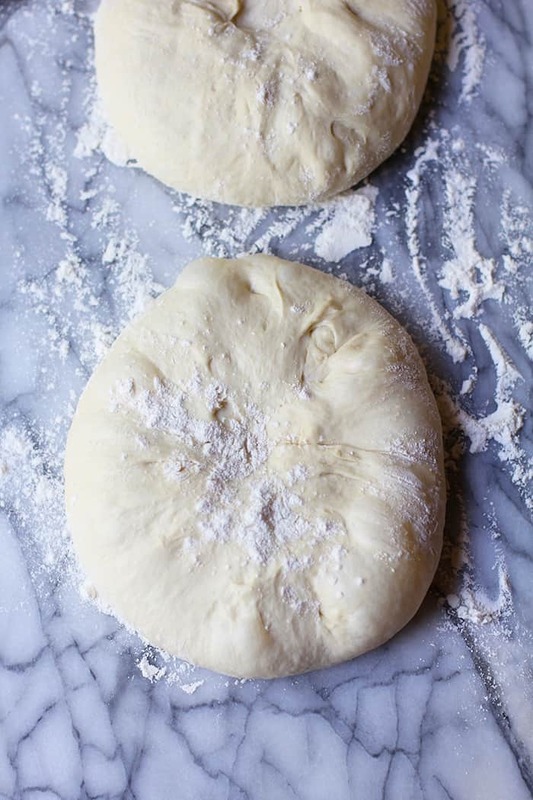 Place dough rounds in freezer bag, and freeze immediately. The night before you make pizza, place as many rounds in the refrigerator (from the freezer) as you intend to make. * A few hours before baking, take the dough out of the wrap, and place in greased bowl. Cover with a clean dish towel, and let rise. When dough has doubled in size, press into pizza pan. * Note: Depending on where you live, the temperature outside your house and/or inside your house, you may need more or less time for the dough to rise. Experiment a bit, and if the dough is ready too far ahead of time, place it in the refrigerator for awhile. If it’s not ready to bake when you want it, place the bowl over another bowl of warm water for awhile. Alternatively, you could start the oven on a low temp, turn it off, place the dough in the oven for a bit to get it moving along. An easy six-ingredient pizza dough, that's easy to make ahead and freeze for a rainy day. In a large standing mixer, combine yeast, sugar, and warm water. Be careful to use WARM water, not hot. If the water is too hot, the yeast will disappear and you can't make bread without yeast. Mix and let sit for about 15 minutes to get the yeast working. You should see little bubbles in the water. Add the oil and salt and stir with spatula. Attach dough hook to mixer and add about half of the flour. Start the mixer and let the flour absorb. Gradually add more flour, a little bit at a time until the dough is less sticky and pulls away from the sides of the mixer. You want the bread dough to be slightly sticky, but not too much. When you touch the dough, it should bounce back slightly. Be sure to leave the mixer on for several minutes after you get the right consistency. Grease a large bowl with canola oil. Add dough to the bowl, making sure you smooth it into a ball, by punching it down - starting in the center of the dough. Place dough with smooth side up and cover with a clean towel. Let the dough double (approximately) in size. Once doubled, divide it into three sections. Grease cast iron skillets (or any pizza pans), and flatten dough into crust, smoothing it and pushing it up the sides of the pans part way. Cover with towel and let the dough sit for 20 minutes before adding pizza toppings. Bake pizzas in hot oven - 450 degrees - for about 15 minutes or until done to your desire. 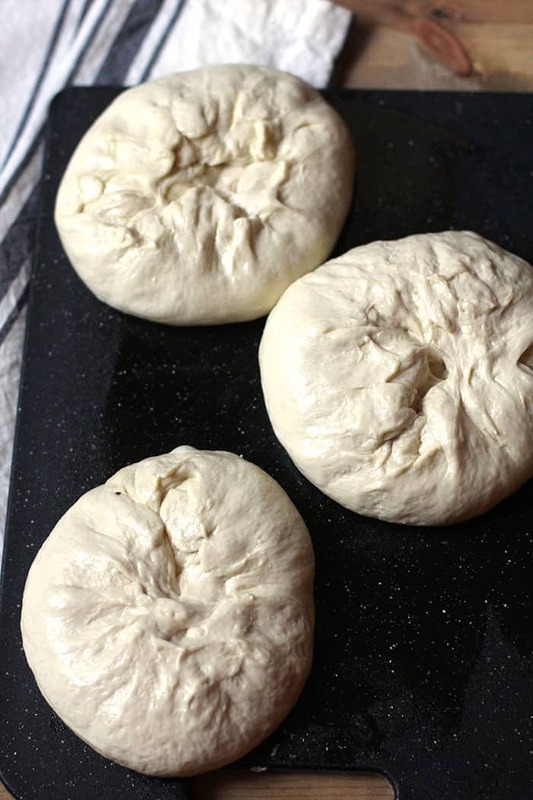 The pizza dough can be made up ahead of time and frozen into individual pizza doughs. 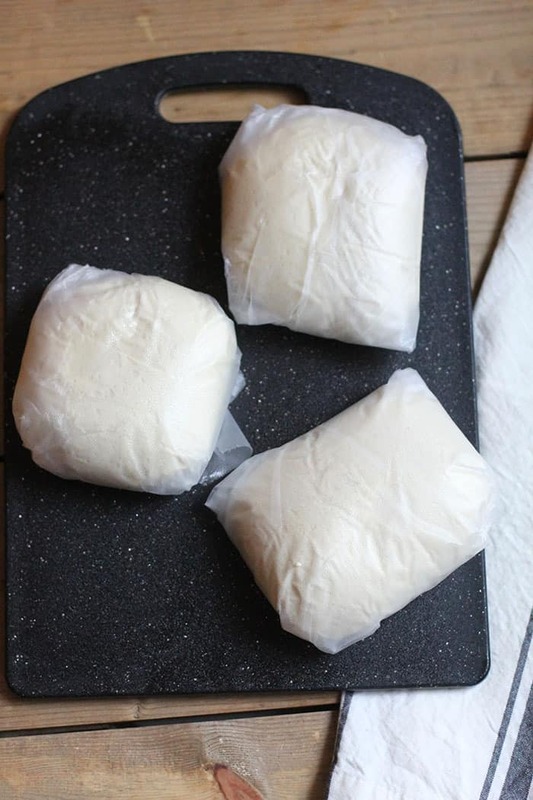 Just wrap the dough tightly and seal in freezer bags. Set them in a bowl on the counter the morning of your baking, and keep them in a warm place until ready to bake. If they are taking too long to rise, you can start oven and place pans inside for a few minutes. 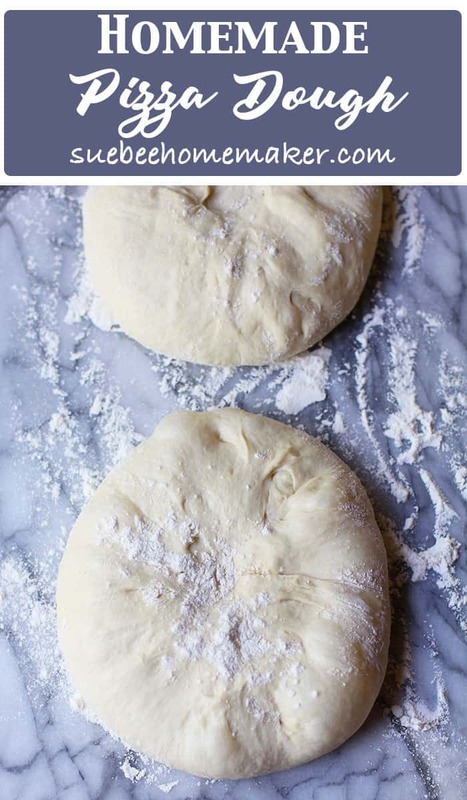 This is awesome and EASY pizza dough. 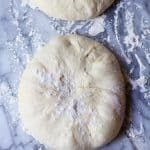 I’ve done a lot of research on pizza doughs for our family wood fired pizza night and this one is perfect. I can start the dough at the same time that I fire up my Kamado grill – no overnight prepping and the crust turns out just right every time. I’ll use this simple recipe every time! Yummm! My family inhaled the pizza! I agree with Mike – the cast-iron skillet is the way to go! This is an awesome recipe and it’s only 6 ingredients! If you can find a cast iron skillet, it will take the taste and enjoyment to another level. Good luck!